Online Store - Sliding screen doors, screen frame, porch screening, window screens. Let us help you have your replacement sliding screen doors sized for your location with units that are custom cut to your measurements. Whether you want the perfect patio sliding screen doors or are in the planning stages of your new sunroom and want a custom sliding screen door kit, we have the latest products to help you get the job done right. With our help, you can create the perfect setting and start enjoying your patio, deck, or pool area even sooner! Our deluxe Patio Sliding Screen Doors work well in high traffic commercial or residential environments. Click on the picture below for additional specifications and ordering information. Is your door screen ripped or torn? Are you tired of mosquitos, bugs, or pests sneaking into your home? Maybe its time to replace your screen in your screen door! Apex Products is proud to provide you with screen door replacement screens that are perfect for your sliding screen door or patio screen door. We offer several options of screen mesh material to fix your old patio screen door or window screens. Pet screen, Tuff screen, and regular 18x16 fiberglass mesh is what you have to choose from with our replacement screens. The widths of insect screening we have available is 36", 48", and 60". You can choose the lengths of replacement insect screen from 77" all the way up to 97". Take a look at our screen door replacement screens and upgrade your sliding screen door today! In our heavy duty extruded porch screen material for larger doors, you'll find a selection of screening materials and frames, as well as the SCREENEZE porch screening system. Whether durability is a concern or you want something functional and decorative at the same time, we have exactly what you need. Our custom built screen panels for replacement sliding screen doors are strong, easy to construct and install, and provide the professional look you want, including insect screening selections. Apex Products is dedicated to carrying exclusive products, including insect screening, that are made to help you make your porch, sunroom, lanai, or patio area more enjoyable and functional. You can avoid problems like insects and other outdoor debris invading your area while still enjoying the sounds, smells, and feel of the outdoors when you use these top quality porch screen material with perfectly matched porch screen frame options. Read more about our products and get started on your replacement sliding screen doors today! The best insect screening will work and go virtually unnoticed, leaving you to enjoy a gentle breeze without any pest invasion. 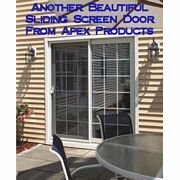 Here at Apex Products, we carry screening for sliding screen doors with high visibility, as well as fiberglass screen mesh and aluminum screen wire to suit any application you choose. Whether you want to make your porch more usable or create a barrier for a three-season room, you can search these products to build your replacement sliding screen doors. You'll find fine mesh insect screening, also known as screen cloth, which is designed to keep out even the smallest bugs. Say goodbye to the infamous no-see-ums! The fiberglass screen mesh for sliding screen doors works beautifully for the pool and patio area, and we even carry a polyester screening that will stand up to pets and pests! Apex Products is committed to offering the best products to get the job done right. Read more to determine the insect screening that will work properly for your replacement sliding screen doors. When you shop online at Apex Products, you can find everything you need when you want to install a new patio screen door. The SCREENEZE porch screening system is a patented fixed screen system, featuring an aluminum base and a vinyl cap which are snapped together and attached to your porch or gazebo. ScreenEze's porch screen material can be installed on the inside, outside, or center of your porch post and rail design. It is perfect for individuals interested in a sliding patio screen door replacement. From new installations to restoration projects, Apex Products is the best place to find porch screen material and selections for your sliding patio screen door replacement projects. We understand your needs and provide you with a wide array of products that work well for your needs. Review the patio screen door materials featured here and place your order online today. We are confident that you'll be pleased with the products we have to offer. Whether you're building a new porch or sunroom and need custom extruded screen frame options or simply want to purchase replacement sliding screen doors, Apex Products, your online source for heavy duty sliding screen door selections, has you covered. Read the detailed descriptions of our extruded aluminum screen frame products to find the items that will work best for your project. What is an extruded screen frame? An extruded aluminum screen frame is created by pushing heated aluminum through a shaped opening in a die machine. This material is less likely to bend than roll form frame, creating a stronger frame suitable for larger openings such as porch screens. Got questions about how this option will work with your sliding screen doors? We are here to help. You'll find articles to learn more about using the extruded aluminum screen frame options. When you are repairing the windows and sliding screen doors at your home or adding a porch on to your home, our selection of top quality products, including replacement sliding screen doors and heavy duty sliding screen door selections, will help you get it done right. Count on the experts at Apex Products when you are seeking window screen frame options, screen spline, and replacement sliding screen doors. We offer roll-formed window screen frame that is lightweight and great for use in smaller window openings. Whether you are working on a DIY project or a builder who needs professional materials, our business always makes sure you have access to affordable options that fit your needs. 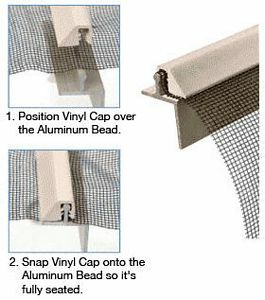 Rolled aluminum window screen frame is used by builders in most residential applications, and are popular for DIY projects because of the lower cost. For additional information about this style of window screen frame, all you have to do is click on the menu on the right side of this page. Contact us to inquire about our window screen frame selections, screen spline, and replacement sliding screen doors. We are standing by to give you more information about the high-quality products we have for sale. Shop for porch screen material and replacement sliding screen doors online at Apex Products. Our competitively priced screen spline is available in several sizes and varieties. 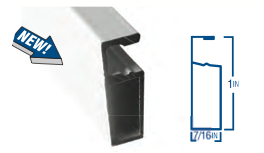 We carry the vinyl serrated screen spline for door screen repair, and these bulk spline rolls are available in both gray and black spline to coordinate perfectly with your door frame. Because we carry only top quality items, these screen spline products can be used in both commercial and residential applications for door and window screens. The gray spline will blend right in with aluminum or fiberglass mesh and the black spline coordinates nicely with darker mesh and bronze frames. Read more on each bulk spline roll to choose the size and color that will look best for completing your door screen repair or other project. Apex Products has you covered for all types of repair and construction projects involving windows and doors that need screening. Find the porch screen material and replacement sliding screen doors you need today. From window screens to screen enclosures, Apex Products carries everything you need. Whether you are looking for screen spline or replacement sliding screen doors, we have you covered. Our inventory includes the cutting edge utility knife and screening tool combo, a unique instrument that does it all. It is two tools in one, allowing you to use it as a spline roller and a heavy duty knife at the same time. Whether you are installing a new sliding screen door or building a new porch, we have the items that you need. Features of this selection include a tool free blade change and wheel operation, a low profile knife tip that allows for the easy trimming of screen wire, and a heavy duty body that makes screening in pet and solar screen a breeze. Place an order for this tool the next time you are purchasing screen spline, replacement sliding screen doors, or sliding screen door accessories from our business. Save money when you shop for porch screen material, patio screen door selections, more when you check out the clearance section at Apex Products. Our business offers clearance pricing on our pre sized, standard frame sliding screen door kits. Are you in the market for sliding patio screen door replacement options? Then check out this selection today and see if it's fits your needs and budget. Please note that quantities are limited, so you should purchase this screen door kit as soon as possible. From sliding patio screen door replacement selections to porch screen material, our business has everything you need to build your business. We know that it's hard to find a lot of these patio screen door and screening products locally, so we offer great deals on everything you need for your next project. Take a look at the items we have available and place your order online today. We are confident that you'll be pleased with the items you purchase. Mid-Michigan's Leader for Condominium, Apartment and Rental Unit Screen Services. Screen repair, new window screen fabrication, porch screening and custom sliding screen doors. We offer professional commercial services for contractors and property managers needing multiple window screen units or sliding screen doors. Contact us to receive a fast, competitive price quotation. Real estate managers will appreciate that our trained repair experts have a complete inventory of repair parts and screen framing, assuring a quick turnaround of your window screens and door screens. Give us a call and "git-er-done"! Looking for a Sliding Screen Door Track or Jamb to complete the benefits of enjoying a gentle breeze, or maybe the clean fresh air flowing through your house? If you find that your sliding screen door is not functioning as expected and the wheels are in good condition, consider the condition of the track, which can break down or become bent. TheVE2X track is made of extruded aluminum which is designed to handle the toughest environments. The track is cut into two pieces 80 1/2" long each. The Jamb length is 144" but has to be cut due to shipping, one piece is 96" and the other is 48". So before you go and throw out your old sliding patio screen door, check the track that might be all you need. Why replace your old existing sliding screen door when all you need is replacement parts! We have rollers, corners, adjuster screws for roller assemblies, spline and handle sets to fit most screen door manufactures. If we don't have the screen door part your looking for, just give us a call or send us a picture of the part you need, and with all our supplier options I'm sure we can get what you need! Make heavy duty new or replacement window screens with our affordable EXTRUDED aluminum screen frame. This extruded aluminum screen frame is ideal for large openings such as porches, gazebos and commercial applications. Six 96" pieces per PK. New BetterVue insect screening for windows, doors and porches is an excellent visibility insect screen. For jobs requiring new track for sliding patio screen door installations. Use crossbraces to add strength to larger sized window screens.